Large scale infrastructure is often very dominant in the Belgian urban landscape. It plays a key role in structuring urban and rural areas. In the past these infrastructure works were too often treated as independent regional technical projects, without taking into account the local conditions that were met. Especially in Belgium, a densely populated country with one of the densest highway networks in the world, the effects of this approach are very tangible. Recently more and more new projects are initiated trying to improve the local integration, sustainability and multifunctionality of these infrastructures. How can we connect the regional to the local scale and give this infrastructure meaning on both levels? How can large scale infrastructure become a connection in all directions, instead of an obstacle? The highway network is maybe the most eye-catching example of a large scale technical project that cuts through the local landscape. Highways assure good interregional connections but cause important interruptions on a local scale. Historical and functional connections are disrupted which can have an important effect on local life. If we are looking for a better integration we will need a more integral design approach. That way a highway is not only a project of engineers but also of urban planners, landscape architects, historians, users,… Together they face the challenge of giving the infrastructural space an identity and use on all levels. 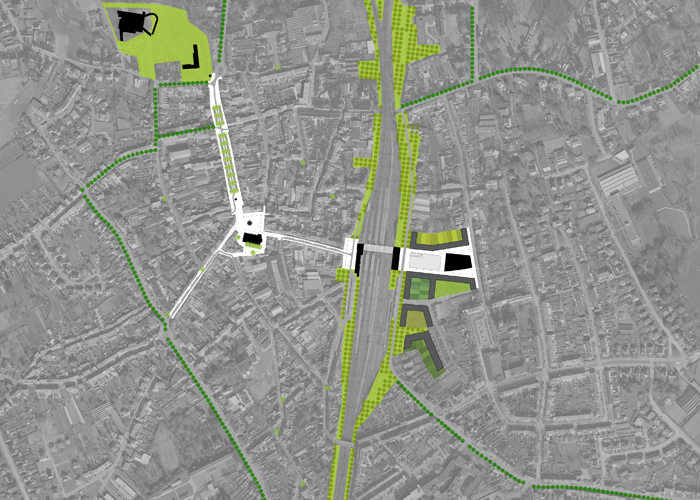 In Antwerp we worked on a competition for the redevelopment of a node on the ring road. In this place a combination of railways and highways disrupts the historical relationship between the densely populated neighborhood of Borgerhout and the Rivierenhofpark, part of a bigger ecological network along the valley of the river ‘Schijn’. In the competition we researched different ways of re-establishing this relationship. By optimizing the infrastructure we are able to ‘collect’ all the leftover green spaces in-between the infrastructure into one big new neighborhood park ‘Rivierenhof Intramuros’. This park can be extended by partially covering the highway with a park bridge. 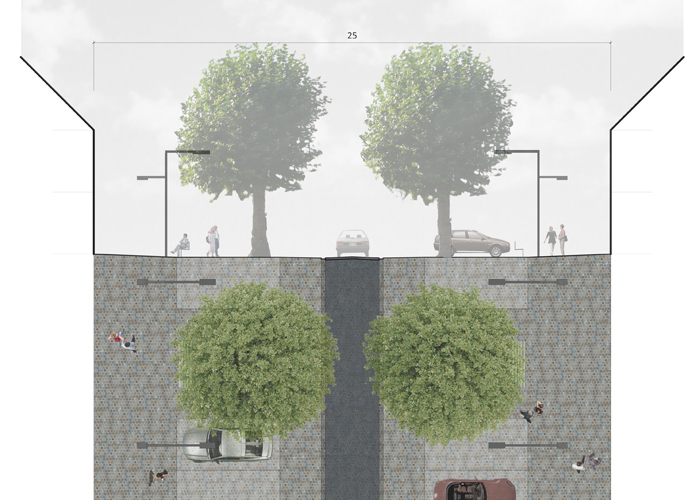 The current topography is used and reinforced thus creating protected spaces in the neighborhood in the middle of a traffic node. 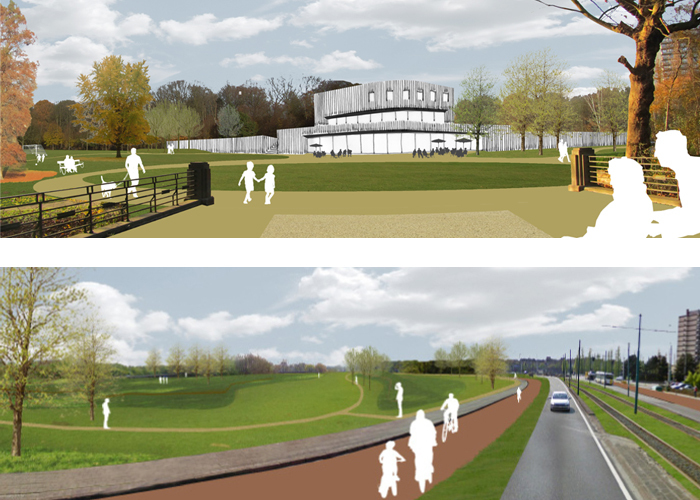 In our masterplan for the redevelopment of the former border post in Rekkem, along the E17 highway, we also used the introduction of an intermediary landscape as an interface between the highway landscape and the local landscape. The extensive railway system is another infrastructure that is often an important project in new development plans. Just like highways railways often create sharp edges in urban and rural textures. 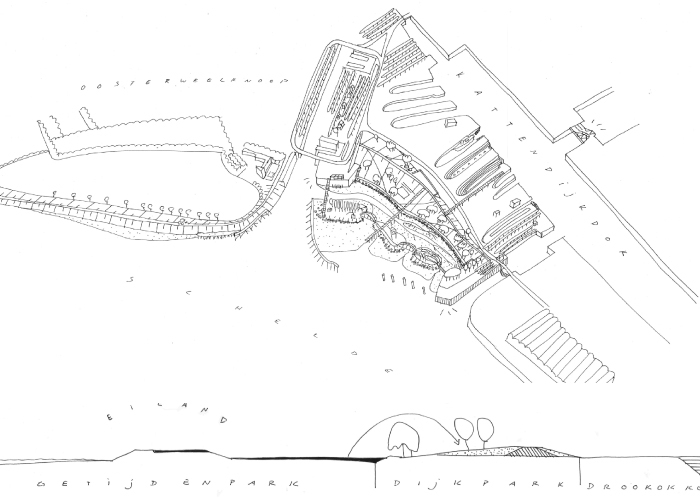 In the competitions for the making of a masterplan for the centers of Heist-op-den-Berg and Zottegem this theme recurs. In both municipalities the railway separates two parts of the center. In both propositions we use new public spaces and buildings to re-establish and reinforce the connection between the two sides. Infrastructure is not only line-shaped. Big areas, like old industrial sites, can also have an important effect on their surroundings. The relationship between them is often unplanned, direct, hard and negative. With the redevelopment of these sites new possibilities for a better integration arise. We can try to create new opportunities on all levels and spatial quality for both the site itself and its surroundings. The competition for the ‘dry dock park’ in Antwerp, for which we collaborated with HNS landscape architects, is a good example of this. 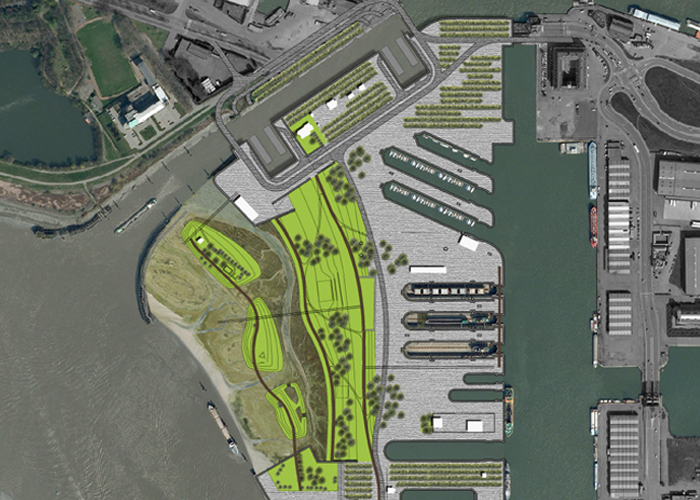 The Antwerp harbor is moving northwards, allowing the city to redevelop the former harbor areas in the same direction. The island of dry dock will gradually also become a part of the city and will, step by step, be developed into a metropolitan attraction. This ambition, together with the ecological value of the river banks, has shaped our proposition to a sequence of public spaces with different uses and various relationships with the water. The UCO project site in Ghent used to be a huge textile factory right next to a densely populated neighborhood, without any relationship between the two. With our masterplan we not only redevelop the factory into a contemporary business park, but we also strengthen the integration in the neighborhood by creating a neighborhood park around the business park as an mediating space between the two.